Properties in the area of Krasen and Rosen villages are becoming increasingly difficult to find. Holiday home seekers from Bulgaria’s capital, Sofia, look for holiday homes here as do numerous buyers from countries across Europe. But we are pleased to offer here a better condition property at a sale price less than what you could possibly find elsewhere. Lavender cottage is a good sized three-bedroom property, with hallways and kitchen. Plus a cellar. It’s decorated and furnished in a traditional style and contents are included in the sale. Water and electricity are connected and this is a freehold property that we’ve exhaustively checked to be free of all liens. The house is set towards the front of a large plot of 1250 m². There are some outbuildings and the plot is at present mostly given to the growing of sweet corn, plus there are quite a number of fruit trees. As the previous owner was elderly, the ground would benefit from some clearing but once this is done they’ll be plenty of open areas. Sale price is just €8900. We’d like to emphasise that this is an incredibly low price for this location. 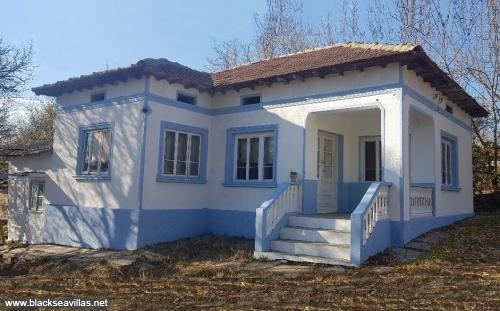 Be very wary of lower-priced Bulgarian properties in remote locations. They can be in gypsy villages and like in any other country, it’s important not to buy in a bad area. Rosen village is a well thought of place that will make an ideal holiday or retirement home, or place to relocate to. It’s quiet and friendly. On the day of our visit, the neighbour opposite who was having his roof redone chatted about his days as an Army captain. Locals are likely to offer you food and drinks. It really should be a great place to relax. At the remarkably low selling price, this property more than allows for a budget for modernisation. The property is located in an increasingly popular location in the North-East of Bulgaria - Dobrudzha. Just 38 miles to the white beaches of Balchik, close to Kavarna beaches too. The village is quite big and benefits from its close proximity to the larger village of Krasen, which a restaurant and a pub, a community centre/library, medical centre, Christian church, two museums, big school and a bus station offering regular public transportation service to all the surrounding towns - Dobrich, Balchik, Kavarna, Shabla, Durankulak. It’s a beautiful area not far from the coast that is attracting tourism development. The cottage is also only 3 miles away from the well known and beautiful Lake Dryan. This property has been selected from many others, as offering the best value that’s possible to find. It should prove an excellent investment for you. As all the papers are already in order and is no need to visit Bulgaria complete the purchase, if you so wish. Contact us now regarding this excellent offer.